When people think of pest control, they normally think of cockroaches, ants, termites, silverfish and other creepy-crawlies that we find in and around our homes and businesses from time to time. Colorado Pest Management certainly does our fair share of pest control for these pests, but we also handle critters that people don’t normally think of, such as birds, squirrels, and other outdoor animals, as pests. It is precisely when these animals cease to live outdoors, and move into your home, garage or business that you may need help from Colorado Pest Management to get wildlife out and keep it out! 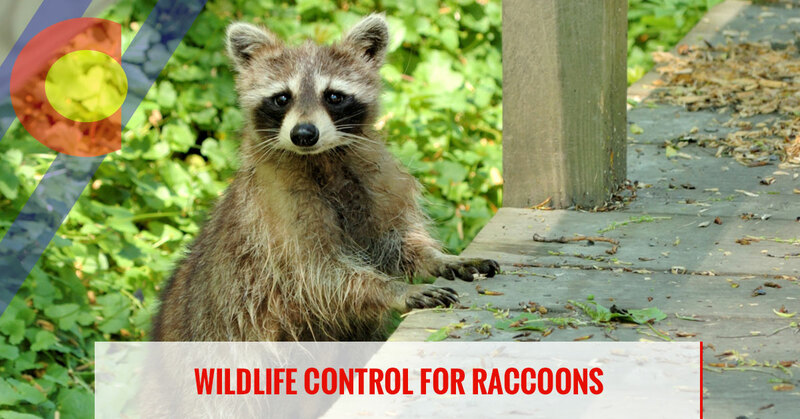 We offer a wildlife control and exclusion service to control wildlife such as squirrels, raccoons, skunks, bats, and voles. When you have a wildlife issue anywhere along the front range, from the Colorado Pest Management is the best pest control company to call for safe, non-toxic pest control. We service Elizabeth, Parker, Littleton, Aurora, Englewood, Lakewood, Denver, Boulder, Longmont, Loveland, and Fort Collins. If you have lived in Colorado for any amount of time, you know that coexisting with wildlife is part of the package. We often see deer, elk, bighorn sheep, prairie dogs and the like, and they are wonderful to see and photograph, but when the smaller variety of furry Coloradans start to make a home on your property, it’s time to act. You may think they are harmless and cute, but they can pose a danger and should be removed and re-homed somewhere away from people. In this week’s blog, we’ll look at a few of the more common wildlife problems we have in along the Front Range, namely raccoons. Almost everyone loves to catch a glimpse of those rascally trash pandas – raccoons! Well, everyone except people who have had to cleanup trash they’ve gone through and left strewn all over, or whose pet got into a fight with them, or who have had to repair damage to their house caused by them. Yes, raccoons are fuzzy and cute, but they can cause problems when they become unwelcome regular visitors or worse yet, residents. There are good reasons to not want them around your home and when they are there, call Colorado Pest Management to have them safely removed and to make sure they stay out. Like much wildlife, raccoon carry diseases that can endanger the health, and even the lives, of people and pets. Raccoons can carry roundworms, leptospirosis, and can carry rabies. According to the Center for Disease Control (CDC), Leptospirosis can “lead to kidney damage, meningitis, liver failure, respiratory distress, and even death. It is found in the urine of some animals and is found in soil and water where infected animals have been. A roundworm, or Baylisascaris, is a parasite that passes it’s eggs through the feces of the host. Raccoons are known carriers of roundworm. Children and domesticated animals can pick up the eggs through their play and become infected. Rabies is always a threat when you are talking about peridomestic animals, that is, animals that live close to humans. If a raccoon has invited itself into your house or garage, you will know that the damage they can do is remarkable. They can tear away parts of the siding, framing, air ducts, roofing, and will shred insulation and anything else that is the way when they are making their nests. Raccoon colonies use what is called a latrine, a communal ‘bathroom” which, if in your home, will smell and be a petri dish of the diseases named above. Colorado Pest Management uses what is known as Integrated Pest Management and is a people-pet, and kid- friendly. To control raccoon, a trap will be used and once trapped; the animal will be humanely released elsewhere. We always respect animal welfare when trapping unwanted wildlife. We will then work to prevent reentry buy other raccoons. Repairing damage and repairing entry ways is the best way to make sure another raccoon family doesn’t take up residence when the original family has been trapped and taken away. Cleaning up and deodorizing the area is also important to ensure the good health of people and pets. Other measures, such as installing baffles on birdfeeders, branches that overhang your roof, securing any animals, such as chickens that could attract raccoons. To find out more about our natural, non-violent but effective raccoon control methods, call Colorado Pest Management.